For the major poets of Osip Mandelstam's generation, poetry represented a calling in the most tangible sense. To respond to it meant to fashion from the available cultural and personal material a mythic self, one that could serve both as the organizing subject for poetry and as an object of worshipful adoration. A successful poet like Mandelstam thus became the focal point of a complex cultural phenomenon-perhaps a charismatic cult-that shaped his writings, gesture, and reception. Gregory Freidin examines Mandelstam's legacy in this broader context and lays the groundwork for approaching modernist Russian poetry as a charismatic institution. He traces the interplay of poetic tradition, personal background, historical events, religious culture, and political developments as they entered the symbolic order of Mandelstam's art and helped determine its outlines in the reader's imagination. Many important aspects of the Mandelstam phenomenon, including the Jewish theme, the meaning of the poet's Christianity, his political stand, and, in particular, his conflict with Stalin and Stalinism, receive here a new interpretation. A case study in the emergence of a literary cult, A Coat of Many Colors reveals how Russian poetry of the early twentieth century functioned as a charismatic institution of a distinctly modern kind. Those who belonged to it combined knowledge of the recent studies in myth, magic, and religion with the cultivation of verbal magic, mythic consciousness, and unorthodox religious beliefs. Following Mandelstam's career over its entire span (1908-1938), Freidin shows how the poet benefited from literary scholarship, comparative mythology, the history and sociology of religion at the same time he was emulating in his poetry the very subject of these academic disciplines. To account for this duality in interpreting Mandelstam's writings, Freidin draws on explanatory paradigms of contemporary human sciences, from Saussure and the Formalists to Weber, Durkheim, Freud, and Marcel Mauss. "Friedin writes just the kind of criticism Mandelstam wrote and which he would have loved: grounded in careful reading but never timid, quirky but never merely eccentric, the product of a mind and sensibility keenly alive to the times, both historical and critical. . . . Nothing I have read on Mandelstam has so provoked my own thinking as has Freidin's work. . . . It is stimulating in every sense of the word and will move the study of Mandelstam off the point at which it has been stuck for far too long." 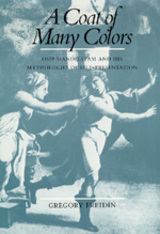 "Combining as it does sensitive close readings of the Mandelstam texts with an uncommonly wide range of literary and sociocultural reference, A Coat of Many Colors is a welcome and significant addition to the body of scholarship bearing on one of our century's finest poets."